The French people are known for their strong opposition to oppression which led to the French Revolution (1789-1798) and eventually gave birth to what is known today as modern France. The modern France evolved around the age long philosophy of “Liberty”, “Equality”, and “Fraternity” which the government and good people of France have been upholding despite various influences from dynamism of international politics. During the Biafran genocide (1967-1970), French people despite belonging to the western bloc, and also a member of NATO decided to diplomatically say a big NO to the Nigerian carnage against Biafran civilians. US, despite seeing the horror of civilian bombardment could not do much due to British influence and campaign of calumny against the Biafran populace. France discarded the British influence and moved in to save thousands of Biafrans from perishing by influencing her Francophone friends to absorb Biafran refugees. The post Biafra-Nigeria civil war cost France a lot no doubt, and Biafrans till eternity will remain grateful to the French people for their noble gesture and timely intervention. It is important to note here that Biafrans never took war to the Nigerian state, rather it was the Nigerian oppressive state who raised militias in the north that massacred hundeds of Biafran civilians for no just cause. It was the same Nigerian government that unleashed the carnage and made sure the dead bodies of Biafrans killed in the Northern part of Nigeria were transported down to Biafraland as a clear warning which led to provocation. Britain applauded the culprits, the defunct OAU applied red tapism, and the Nigerian government defended the perpetrators of the massacre simply because the life of an average Biafran means nothing to Hausa-Fulanis. During this period, France never towed the line of evil Britain and the others who insidiously concurred to the genocide with the deafening silence. We (Biafrans) owe a lot to the French people and wish they maintain their clear repulsive stance against evil. By principle, Ambassadors are only representing the interest of their nations’ positions in their various host states. What they say matters a lot as it is conventionally expected that their words should be in tandem with their home state foreign policy. But history has equally shown us cases of various Ambassadors who deviated from their home state position on certain issues out of selfishness, which often result to an un-analysed response to critical issues of their host country. The statement credited to Mr. Denys Gauer i can tentatively say stems from an un-examined mind, reason being that France unlike Britain, supported Biafrans during the war to avert genocide which unfortunately did not happen as Biafrans were overwhelmed by Anglo-Russo alliance against her nation. 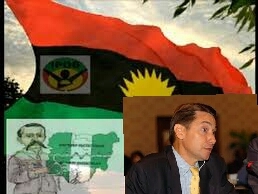 It is atrocious for Mr. Gauer to spew such words considering that France wholly supported the Biafra cause in fighting a defensive war; perhaps Mr. Gauer needs to jog his mind back to history just in case he is bereft of knowledge about the events that took place during the civil war of 1967-70 and the role France played in it. Is it possible that a humane nation who supported Biafrans' war of survival and attrition will suddenly abandon us now when our approach is more holistic and diplomatic in line with the UN's law? Such political configuration engineered by Mr. Denys Gauer does not hold sway as Biafrans are set to have their nation fully restored either way. The unwavering support of France during the Biafra genocide era was not a mistake, rather a move birthed out of good conscience and good will that will never be forgotten. Extending such position in another era where Biafrans are once again facing threat of extinction in the hands of a blood-thirsty tyrant (Muhammadu Buhari) is of the essence and which will be highly appreciated. While many countries who supported the Biafra genocide in various ways are still re-evaluating their positions, France is expected to consolidate on their past efforts, good will and love shown towards Biafrans. Britain is on the verge of abandoning Nigeria for her many internal quagmires which if not looked into could mar the sick inland. While Britain is still as evil as ever, France i believe is humane and will not shy away from her pious stance irrespective of what Mr. Denys Gauer says; they must understand that if there is any time to support Biafrans once again, the right time is now. Notwithstanding, the world must understand that the Biafra restoration project is not anchored on the support of mere mortal but the almighty creator of the universe; IPOB has come thus far without the support of anyone despite the ordeals they have passed through especially since the murderous Buhari-led government started and we are even more determined to get what belongs to us whether or not France or any other nation support our call for freedom or not. Straight to the point. I must commend you for this piece. Very piercing but well articulated. More grease to your elbow. This fight isn't over yet. This crazy world must hear us willy-nilly. Mr. Gauer must have secretly collected some corruption money from Buhari for a promise to disgrace France. How can France support genocidal killings of Biafrans, oppression of Biafrans, dehumanization of Bisfrans, by Britain and the Islamic jihadist government of the fake fraudulent expired Nigeria? It does not speak good of France at all and it does not make any sense. How much of corruption money Mr. Gauer collected from Buhari to sell France to Buhari!!! Understand the French were never in full support of Biafran independence. While De Gaulle did give some diplomatic and military aid to Biafra, both were minimal. French support for Biafra virtually collapsed after De Gaulle resigned in 1968 and Pompidou took over. Pompidou later abandoned Biafra during Nigeria's final 1969 offensive to end the war. The French government, especially under Pompidou, was an enemy of Biafra: Supplying arms to both Nigeria and Biafra-old WWII weapons to Biafra and modern ones to Nigeria. That was why French oil assets in Nigeria were not seized during the war. The Ikemba was so mad with the French for their betrayal that he refused to speak French during a 2001 interview with French state TV in Washington, D.C. Remember also that Napoleon sent an army of 20,000 troops to reenslave the Haitians after their independence in 1804. Bu the Haitians-brave sons of Igboland-wiped them out; and later the British and the Spanish who attacked them. Napoleon, the evil military genius, said: "My decision to destroy the authority of the Blacks in San Domingue (Haiti) is not so much based on considerations of commerce and more as on the need to STOP FOREVER the march of Blacks in the world." That has always been the white man's consistent ultimate purpose-despite all their words and pretensions: To "stop forever the march of Blacks in the world." This is indeed the challenge of Biafra.